With Black Friday and Cyber Monday distant memories, it's time to concentrate on what's really important: saving the world! That's what Facebook's Mark Zuckerberg thinks, anyway, although his plan for making bad things good hasn't been universally welcomed. This week we also discovered why dads spell doom for gaming fun, what specs the Samsung Galaxy S7 is likely to have and why Windows 10 doesn't appear to be winning. 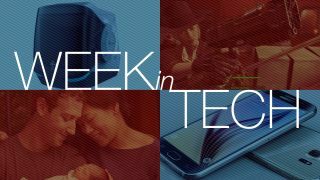 It's time for Week in Tech! Facebook CEO and new dad Mark Zuckerberg has announced that from now on, Facebook will help the world's unfortunates by paying its fair share of tax in the countries where it operates. Only kidding! He's said that he and his wife will give away 99% of their Facebook shares over the course of their lives to various causes that catch Zuck's attention. The announcement was made in the form of an open letter to Zuckerberg's baby daughter, which was of course posted on Facebook. There's a recent trend in gaming that Richard Cobbett calls "daddification": "not simply games about fathers, but games rooted in fatherly fears and concerns – by which I mean of course looking after a younger, typically female character, such as Clementine from The Walking Dead or Eleanor/Elizabeth in Bioshocks 2 and Infinite." The latest daddified game is Fallout 4, which largely acts as an example of how not to do emotion in games. As Cobbett says, "you can't just dangle one of the most primal human emotions in and out of an experience, or treat it as simply flavouring." The Samsung Galaxy S7 is only a few months away, so naturally information is beginning to leak all over the place. It's almost as if somebody was doing it deliberately to drum up interest. The latest rumours suggest that the S7 will look rather like the S6, will have microSD support and a really good camera sensor, and that it may pack the most powerful chip ever used in a phone. If Samsung sticks to its usual timescales we should see the S7 launch in March. What's Apple doing with the next iPhone? We can answer that one: it's testing all the things. Reports say that five different prototypes are in the wild, with a line-up of features that includes wireless charging, TouchID scanning that's in the display rather than the home button, AMOLED displays and USB-C connectors. Some or all of these things may be binned in the final version of the phone – and something else that might be binned is the humble headphone jack. Multiple reports say Apple's planning to get rid of it, forcing headphones to connect via the Lightning port instead. We've got all the latest iPhone 7 news right here. Windows 10 may be a vast improvement over its predecessors, but the latest market share figures suggest that sales are losing momentum. Windows 10's market share in November was 9%, which is fairly good for a new OS, but the share was only up 1.06% compared to an increase of 1.31% the previous month. As Darren Allan says, "this isn't great news for Microsoft, which absolutely must have Windows 10 seen as a big success, particularly after the flop of Windows 8." Doing that without annoying people will be tricky, though. "Redmond needs to be careful that any heavy handedness in terms of persuasion doesn't backfire and make users dig their heels in and refuse to upgrade," Allan says. Flash is increasingly becoming the Schrodinger's Cat of the software world: it's either alive and kicking or dead as a doornail depending on who you ask. This week, Adobe renamed its Flash product as Animate CC – but it didn't kill it off, or tell developers to stop making Flash content. Adobe will continue to support Flash developers and work with Facebook to address vulnerabilities in Flash-based games. So that's clear, then: Flash is dead, except it isn't. Has 3D printing found its iPod? 3D printing is rather like the early days of digital music: it's a niche interest with clever but pricey hardware and a growing number of enthusiasts. What it doesn't have yet is its iPod, the device that turns 3D printing into a must-have. The latest contender for that accolade is the Rever, which has just fired up a Kickstarter campaign to deliver affordable 3D printing that's so easy a grown-up could do it. There's lots to like, not least the price tag: the Kickstarter is currently pricing the Rever at US$284, which works out as around £188 or AU$390. The final retail version will be slightly more expensive, but not dramatically so: US$399 (£265, AU$550).